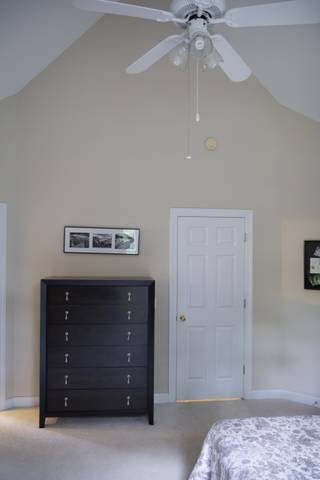 Mix and Chic: A client's master bedroom project! 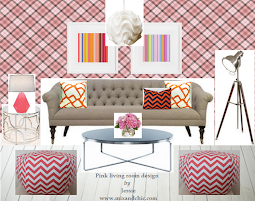 Recently, I have been busy working on a client's online decorating project. 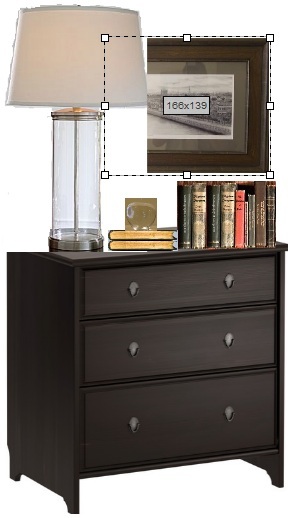 My client, Kathy has hired me to help her with two rooms, her master bedroom and living room. We started with her master bedroom first. This is how her master bedroom looks like now. 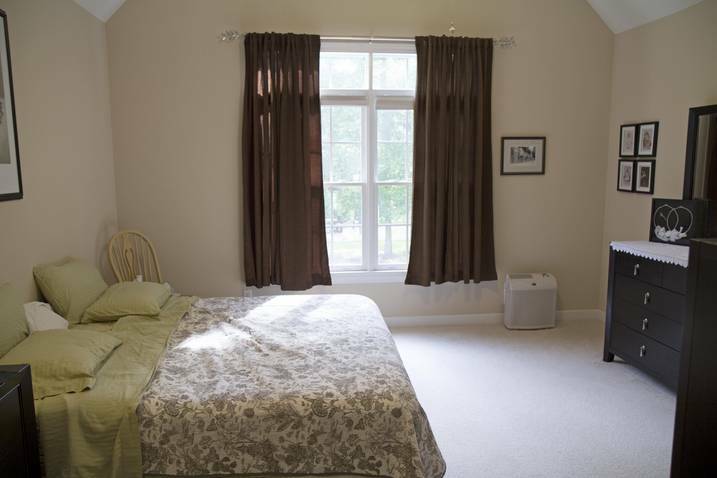 As you can see, her bedroom has wonderful peaked ceilings and beautiful big windows that overlooks her backyard. 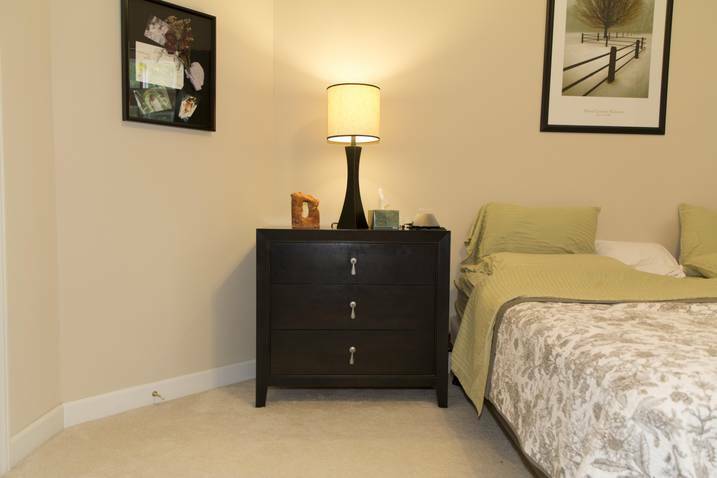 Her bedroom is neutral, roomy and has a lot of potential. In the questionnaire, Kathy wrote that she loves a little bit of vintage, handmade textiles and pieces that feel collected over time but nothing shabby chic. At the same time, she also likes the clean lines of contemporary furniture. She is drawn to blues, greens, reds and turquoise. On the other hand, her husband, Robert loves sophisticated casual transitional style. His favorite colors are blues (in all shades), reds, grays and blacks. 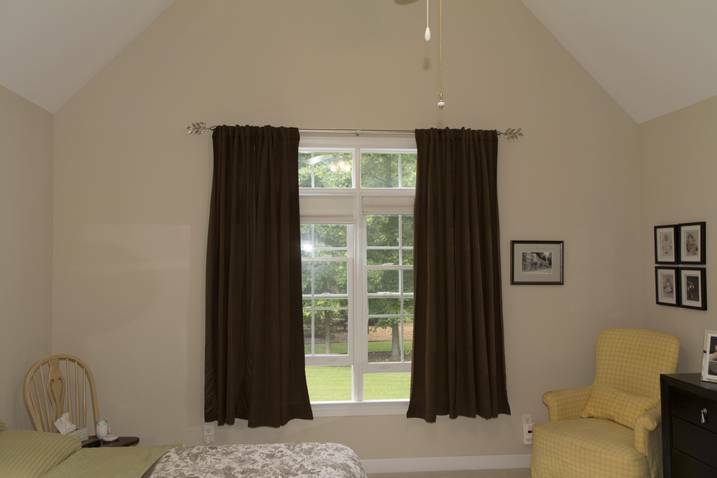 Overall, they wanted their master bedroom to feel warm, inviting, comfortable with some color, drama and pizzazz. They don't mind a little bit of bold color or a funky piece in their bedroom. Kathy loves to read and has collected a lot of artwork. She hoped I can incorporate some of her art in her bedroom. 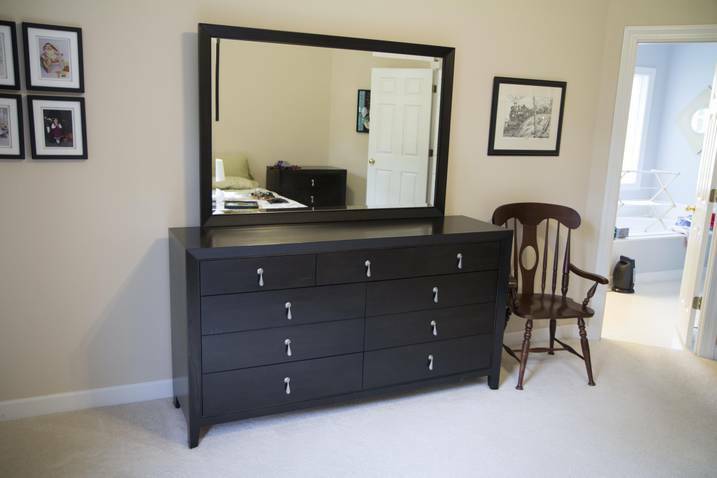 All her bedroom furniture has to stay. Their favorite artwork that is currently above their bed has to stay as well. 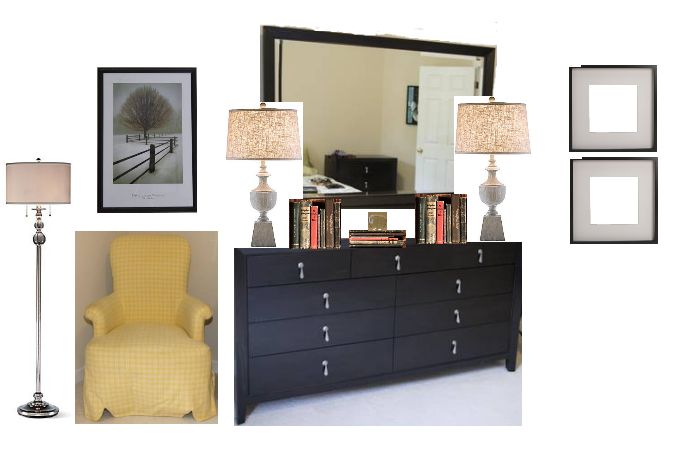 They wanted a pair of new curtains, a pair of table lamps, a reading corner with a lamp and a nightstand for Kathy. They have an armchair and are planning to get it reupholstered. Since they do not have a proper bed, they hope to find a headboard or bed frame but they do not want anything upholstered. I was sourcing for the headboard/ bed frame at first but during the first two days during our design collaboration, I saw this rug on One King's Lane and couldn't resist! It is a very gorgeous rug and measures at 8' x 11'. 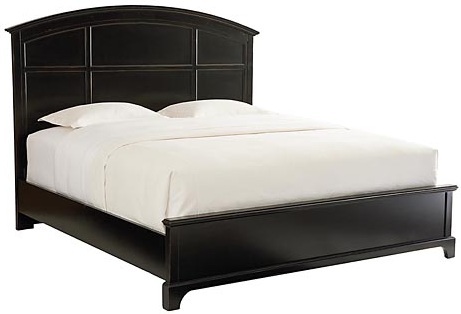 It is a very good size rug and will work with her king size bed wonderfully. It couldn't be more perfect with the handmade textile look that Kathy loves and the color red that they both like. The price tag was $529 and I thought was a good deal considering it is made of 100% wool. Kathy loves the rug as much as I do but she was a little concerned about the overall budget. Before the sales end, I sourced for all the must-have items to tally the grand total. I still went slightly over her original budget. Fortunately, Kathy bought the rug and it becomes the starting point of our whole design scheme. 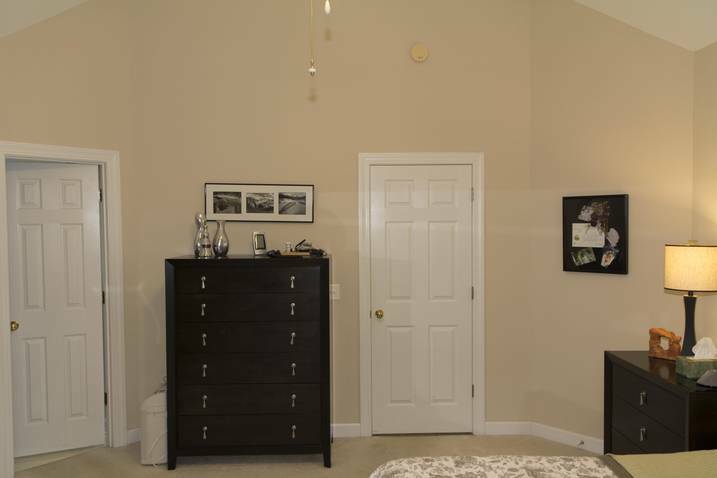 For the wall color, I wanted something neutral and light to balance the bold color and patterns so I picked a light gray color for their bedroom. However, they really liked the blue (above). They tried the blue paint color on their wall but Kathy didn't like it.  I suggested a few blue gray paints, they tried it but still wasn't sure. Eventually, they picked a slightly darker gray similar to the one I suggested and they love it! I am happy that they eventually found a color they both love. Paint colors are always tricky because the same color might look vastly different in two different houses due to the amount of lighting received so it's always a good idea to try paint samples, just to be sure. For her chair reupholstery fabric, I gave them a few options to choose from. 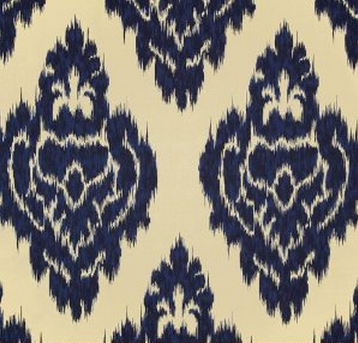 We all decided on our favorite, the Duralee Kalah Blue fabric. 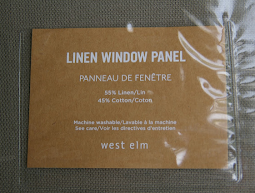 For window treatment, my first thought was red silk curtains. I found a great pair of red silk curtains at West Elm on sale but when Kathy decided to order it the next day, it was out of stock. Bummer! 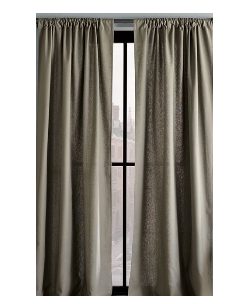 After checking out other curtain options, Kathy decided to make them herself and go to a different direction. 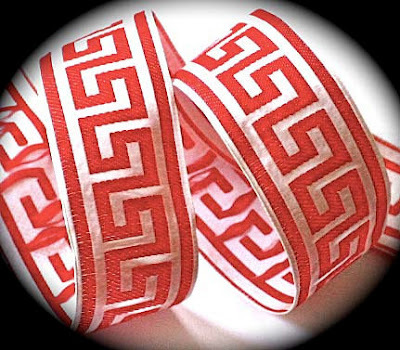 We decided to use white curtains and add this gorgeous red greek key trim for extra pizzazz. It wasn't easy trying to find inexpensive red and white greek key trims online but I eventually found them on Etsy. I think the white curtains with the greek key pattern will be very chic, classic and sophisticated, something that Robert will love. Although I have selected many of the key pieces for their bedroom, there are still a few small areas that required a bit of styling. I tried to stay on the original budget as much as I can so I incorporated a lot of things they already owned like artwork and books for the finishing touches. Using a mix of different artwork and books in a room will instantly create a cozy, collected, lived-in feel, something that Kathy is looking for. 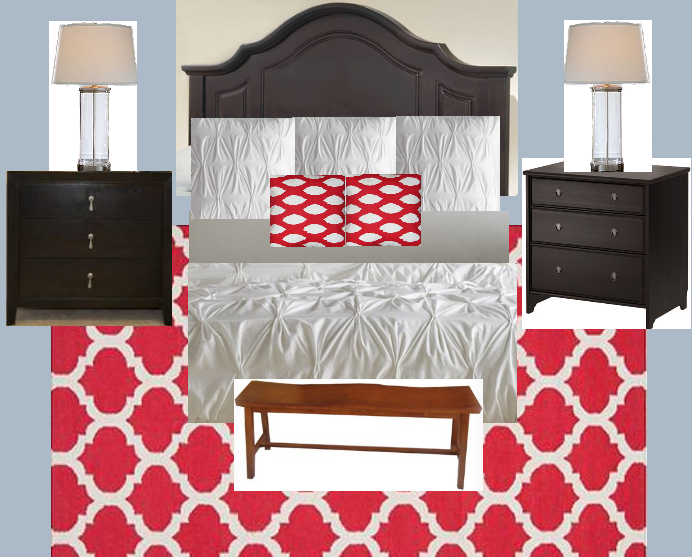 Here is what I came up with to style her bedroom. 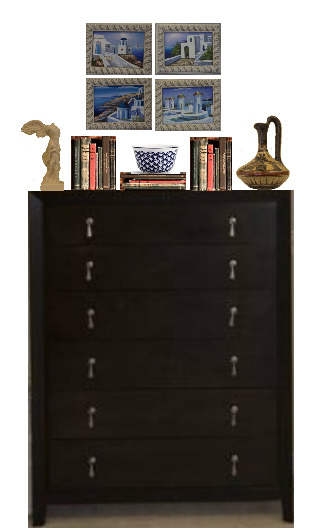 Besides artwork, Kathy also has a Greek figurine and a vase so I group them together with her Greek isle canvases to create a meaningful vignette. Kathy was born in Greece and I really wanted to give her something that is close to her heart. Unsurprisingly, she loves the vignette. Since their bedroom ceiling is quite high, I really wanted something above their bed to draw the eyes up. 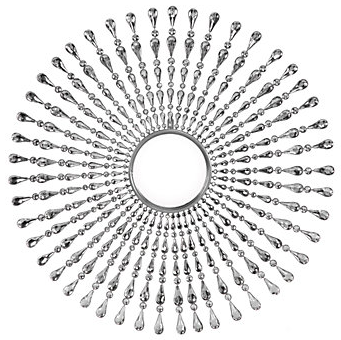 With all the hard lines of their dark furniture, I wanted something round or something with curves to soften them so I suggested a round mirror. Kathy wasn't sure about the mirror idea at first. She wanted her favorite artwork to stay above her bed. As a designer, I wanted my client to be happy with their space. However, if Kathy really likes her artwork to stay above the bed, I am going to make it work. Still undecided, I came up with a side by side comparison moodboard, one with her artwork and one with a round mirror above her bed for her to consider. After she looked at the moodboard comparison, she decided to go with the mirror option. As a plus, Robert also loved the mirror too. I think the mirror looks gorgeous. 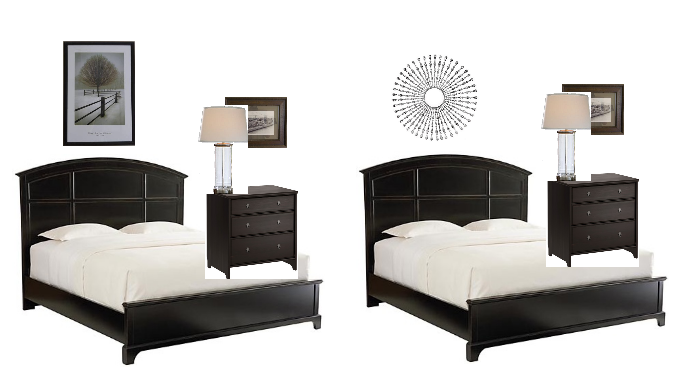 It is also visually light and will add a lot of drama and style in the bedroom. 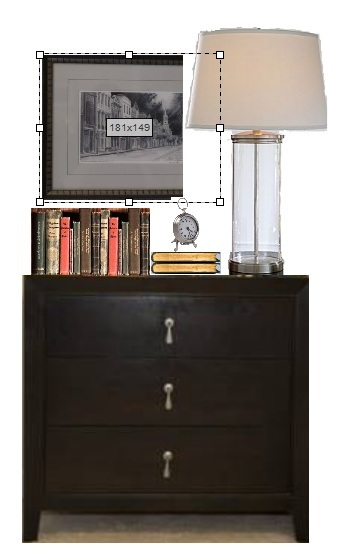 The last moodboard I did is the vignette for the dresser. I am glad that both Kathy and Robert like my designs. 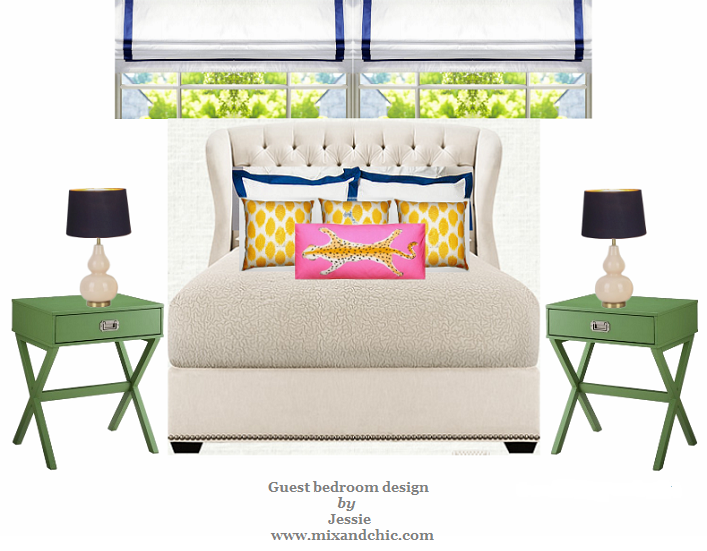 We hit a few design bumps along the way but I certainly had a lot fun putting this master bedroom design together. Kathy is a great client to work with and she is quick with her responses. Clients who give prompt feedback are a blessing because we can made design decisions fast and move forward in a timely manner. I also appreciate she took the time to send me lots of inspirational images and let me know exactly what they like and didn't like. And that truly helped me get a sense of both their style easily. 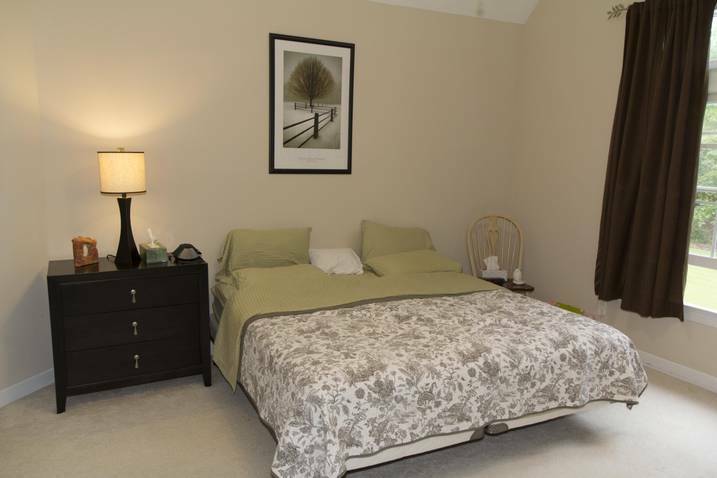 I am looking forward to see the result of Kathy and Robert's master bedroom makeover. I am sure you are excited to see the final outcome of our design collaboration as well. I will share any updates and progress on their bedroom whenever possible so follow along and check back regularly! Great boards - LOVE the rug. Can't wait to see how it all comes out. great job! love that rug! i have no imagination that is why people like you are so wonderful to share. You know I am a sucker for red! :) I love what you put together - can't wait to see how it turns out! That rug is the best. And the Greek Key trim was inspired! I love that your client isn't afraid to go bold! Is this a long distance or local client? I love this process, can't wait for the reveal. Good job!